The entire combo comes with everything — and we mean everything — for less than $200 (more than 20% off the retail price, for those of you scoring at home). It’s got the parts, the pieces, even the tools you’ll need to put those parts and pieces together, and the whole thing goes from your doorstep to your backyard in less than half an hour. 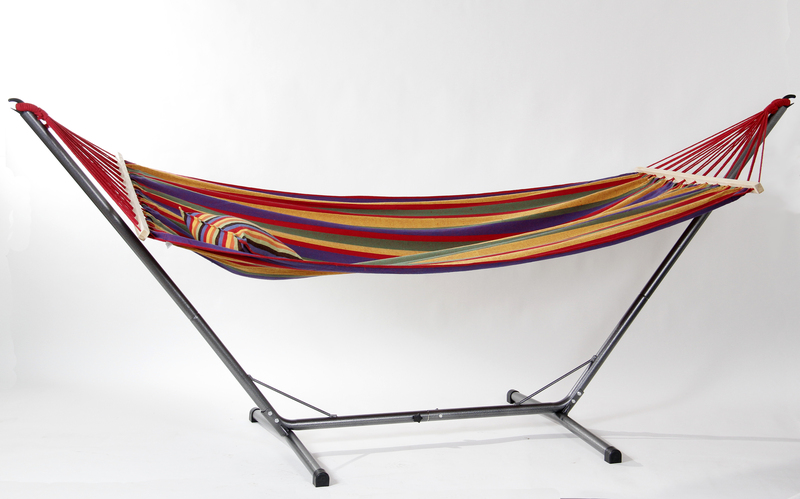 * Mauritius Hammock: It’s the much larger cousin of the Aruba hammock, and the vibrant Multi-Stripe color combination features an anti-tipping design for added stability. The bed size on the Mauritius is a generous 54-inches wide by 87-inches long. * Ceara Hammock Stand: This stand is crafted from heavy gauge powder-coated steel, and is strong enough to support 440 pounds. With a horizontal adjustment along its bottom, this stand can be configured to get the Mauritius hammock at just the right hanging distance. * Brazilian Hammock Pillow: In the same Multi-Stripe color patter that matches the hammock, the pillow is the perfect final accessory for added comfort. Hand-woven from the same T-shirt soft material as our Brazilian hammocks, the pillow turns relaxation into a nap in no time flat. Your Dad is a great Dad, one of the best Dads on the planet. Treat him that way this Father’s Day. This entry was posted in Hammocks and tagged Amazonas, Brazil, Brazilian, Byer of Maine, Hammock, Hammock stand, Hanging A Hammock by beckybyer. Bookmark the permalink.